Manor Executive Suite is a Luxury King or Twin, Sea facing, Separate Bath & Shower en-suite, Private Patio, TV, Coffee & Tea, Bar Fridge, Airconditioner. 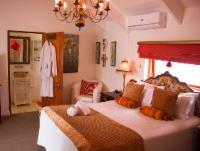 Reflection Deluxe Room has a Queen bed, Balcony, Shower en-suite, TV, Coffee & Tea, Bar Fridge, Airconditioner. Self Catering Unit. 3 Rooms with double beds. 2 Seperate Bathrooms. Braai Area. Limited Sea View. Open Kitchen with lounge and dining room area. 85m from the beach. Option to breakfast at Paternoster Manor. If cancelling 7 days before arrival, forfeit 100% of the booking total. If cancelling 14 days before arrival, forfeit 100% of the deposit. If cancelling 30 days before arrival, forfeit 50% of the deposit. If cancelling 999 days before arrival, forfeit 25% of the deposit.